Have you ever tried to mix a large amount of paint, store it, and the next time you use it there are lumps, flakes or a nasty skin on the top? Do you know what to keep your paint in, and the best temperature for storing? Are you ready for a few tips to make the whole process easier? Well, you’ve come to the right place. 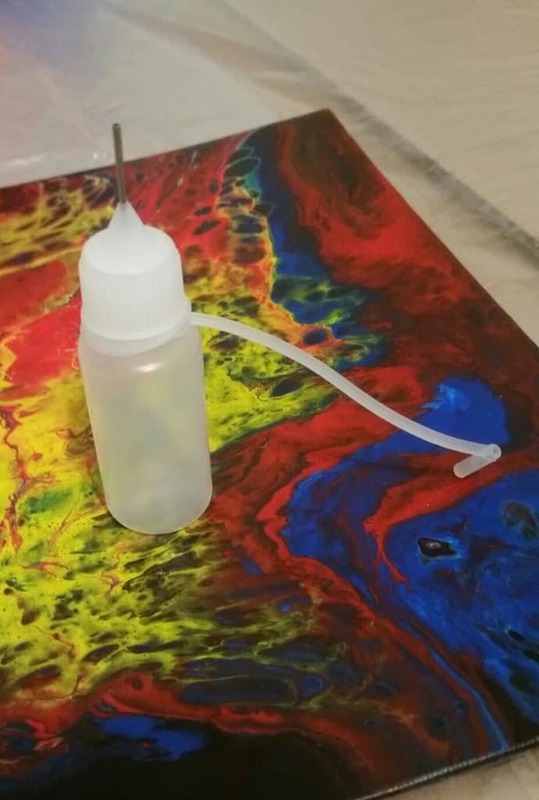 Fluid acrylics are premixed pouring paints which are good to go straight from the bottle. As acrylic pour artists we use paint and a touch of medium, add a dash of silicone and a few drops of water to create the perfect honey pot. 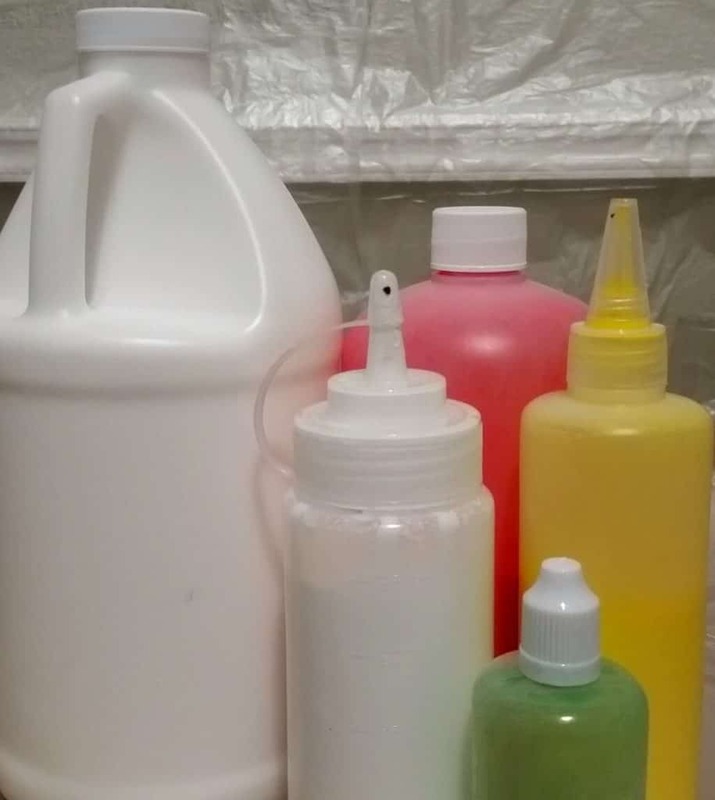 There are many commercial products such as Golden Fluid Acrylics, Artist’s Loft Flow Acrylics, Primal Flow Paint, Matisse Flow Acrylics or Da Vinci Fluid Acrylics; and of course my own favorite, Happy Medium’s Paint Ready to Pour. Whether you are premixing your own to store or using commercial premixed paints, the following tips and tricks can help keep your paints fresher—ready to go when you need them. Lighting: Store away from direct sunlight. Airtight: Store with lid on tight and in a dry location. Shelf life: Most have an indefinite shelf life if not opened and stored according to the above in their original containers. Have you ever mixed up too much paint and weren’t sure what to do with the excess? 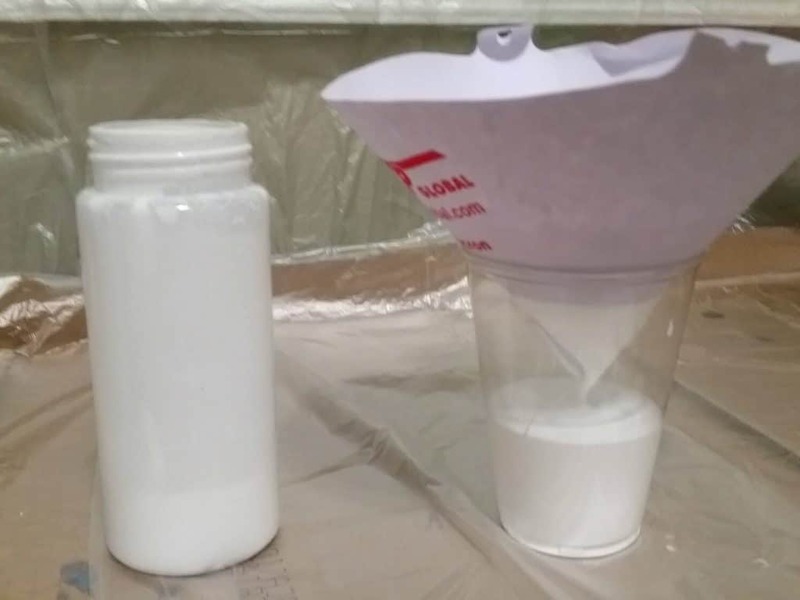 Do you want to transfer commercial fluid acrylics into smaller, easier to use containers? Whatever your reason, here are a few tricks to storing paints in your own containers. Mixing: Start with thoroughly mixing your paints by hand, even if you just mixed them earlier the same day. Be sure to also shake commercial products extremely well before transferring to a different container. Filter: I strongly suggest the use of a filter as you pour into your own container or bottle. There are a variety of filters and strainers such as the disposable cone, mesh, and metal filters on the market. Use whatever you are comfortable with. If you choose a metal filter or strainer, choose one that is an extremely fine mesh minimum of 100 microns per inch. I use a disposable cone filter (190mc) which catches lumps and flakes that I may miss till after it dries. Silicone: Hold the Silicone, well, maybe. Personal preferences for using silicone will play into whether you add any silicone to your own bulk mixtures or not. I’m not crazy about tons of cells in my traditional tree ring or form pours, so I don’t add any silicone when I create my own bulk paints. Whether you use treadmill oil, coconut oil, dimethicone, or any other product, just remember this is the easiest product to add. So basically, if you want the choice of cells or no cells, hold it when creating the bulk mixture and simply fold in a few drops for individual pours. Containers: Stay away from hard or thin plastic (if you can hear it when you squeeze it – don’t buy it). Stick with containers that are silicone or at least a thick soft plastic. These will clean up better; last longer, and be resistant to damage from constant squeezing and manipulation. Plus they tend to be a more airtight option for storage. Container or bottle size, openings, and lid construction should also be taken into consideration. For example, do you want to pour from a large brim or through a small tip? How much paint do you want to store? How many colors do you intend to store? Do you need clear bottles because you want to store multiple colors or varied shades? Do you want an attached cap, or one that comes off completely? Just takes time to process through how you paint and what type of products will work best for you. Here are a few pointers to help keep all your paints fresh and ready to use when you are. 1. Clean tip or rim of bottle with paper towel before storing. 2. 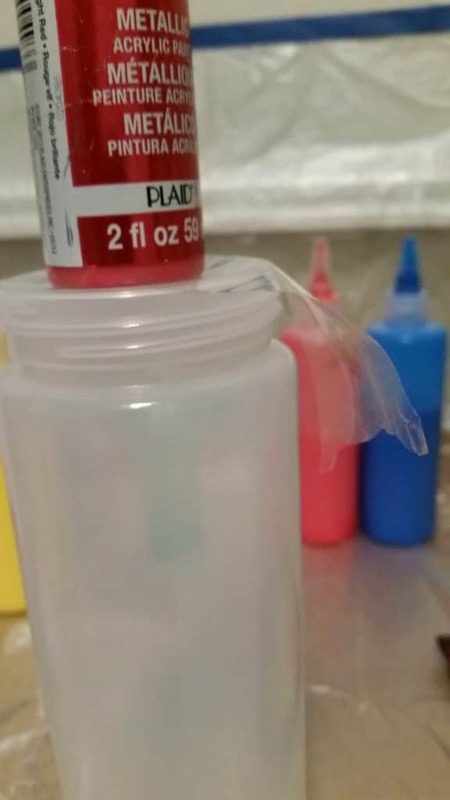 If a squeeze bottle does not have cap on the tip, here’s an option. Unscrew lid; clean lid and rim of bottle; place plastic over top of rim; and replace lid to store. I typically use a piece of plastic wrap or clear packing tape. I prefer the tape as I’m a total klutz and tend to knock things over way too easily. Also, be sure to keep the edges clean so no old paint or tape ends up in your bottle. 3. 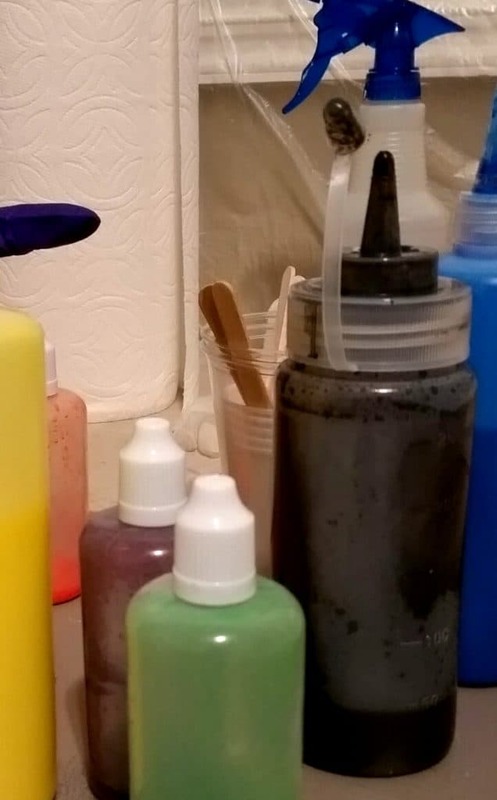 If using smaller bottles with narrow tips like henna applicators, keep in mind that you may need to thin your paint a little more than normal. 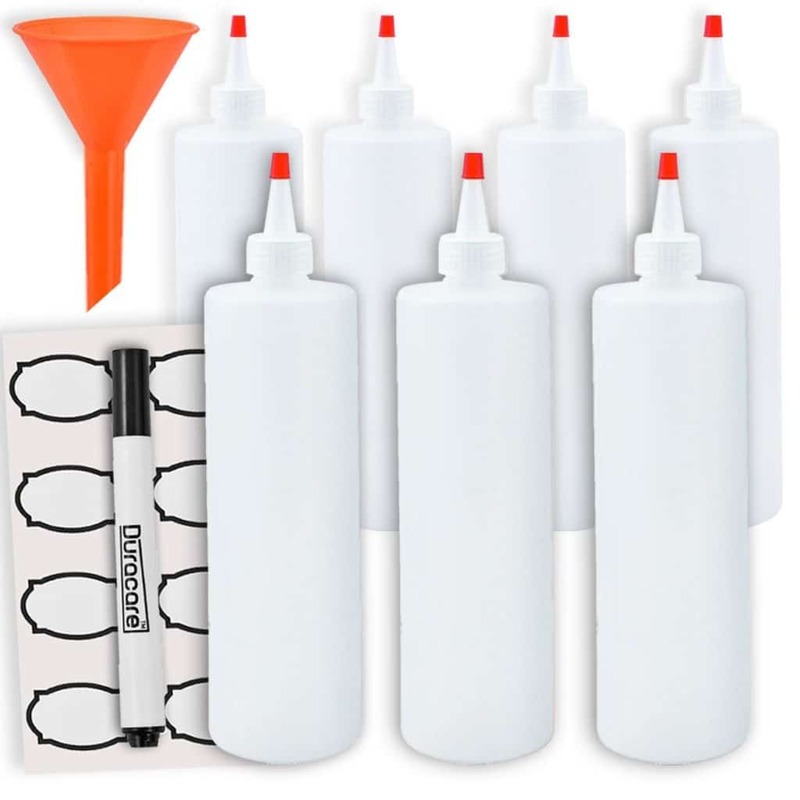 If you find your tips clogging, take tip off and thoroughly clean after “each use.” Make sure you have a secure cap when storing and try using a paint filter the next time you fill the bottle. 4. My paint has a film over the top, should I toss it? No, it’s typically because the top was left off too long and the top layer dried a little. Do Not try to mix this in with the rest of your paint, it will not break down. Instead use a popsicle stick, end of paintbrush or paper clip, basically the tip of anything clean to remove the film. Next you’ll pour remaining paint into a cup, clean your container, and then pour back into the clean bottle through a paint filter. This way you know the entire bottle is free of debris. 5. Follow the Best Practices above for storing all your fluid acrylics. You’ll be happy to have extra premixed paints on hand the next time you’re ready to pour. The little extra work up front will make a huge difference in the end. Best practices for storage gained from articles and standards of practice on: Happy Medium, Golden, Matisse and acrylicpouring.com.